Gabriel Glenn De Roo, better known as Gabe by family, was a good man, a faithful husband and an exemplary soldier by almost anyone's standard. 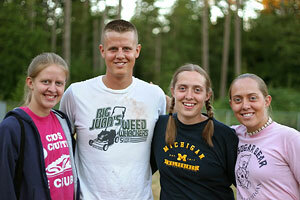 He was born in 1981 and grew up in Paw Paw, Michigan where he learned strong values from church and family. There he also committed his life to Jesus Christ as his personal Savior. As a young man Gabe's work ethic was well known. For awhile he worked for a company that paid according to the number of packages he could move. Gabe worked hard to make additional funds for a car purchase. He moved so many packages that the company put an upper limit on how much it would pay. It was called the De Roo Rule. Gabe wanted to serve his country after the events of 911, so he enlisted in the Army. He was placed in the Arrowhead Stryker Brigade, America's first Stryker Brigade. He excelled in all aspects of combat training. During a twelve mile training run with a heavy pack, he came in first in the entire brigade. Yet he refused to lower himself to foul language. One day his superiors refused to let him go home until he used the 'F' word. He said, "Then I'll just keep working." They did allow him to go home. He had earned the respect of his peers. All who knew Gabe were impressed with his gentle smile, calm demeanor and genuine care for others. He was always more concerned about the well-being of his men than he was about himself. He met Hannah Suko at a Bible study he attended shortly after arriving in the Tacoma area. It was his first time to attend and it was going to be her last she thought. Hannah and Gabe hit it off, she continued with the group and they eventually made plans for marriage after his first deployment to Iraq. They felt God had "brought the pieces together" at just the right time. "War is horrible, but sitting by while evil persists is worse." During his first tour in Iraq he was involved in dangerous missions as a machine gunner patrolling and searching for insurgents. The heat was excessive and the comforts few. In spite of this, he was happy to serve and made many friends among the Iraqi people. He often gave part of his care packages to local children. During this time he reenlisted in the Army for five more years. Nearly every day he would write or call Hannah. He would send flowers on special occasions even though he was half a world away. He also carried a letter to her on him just in case something happened. 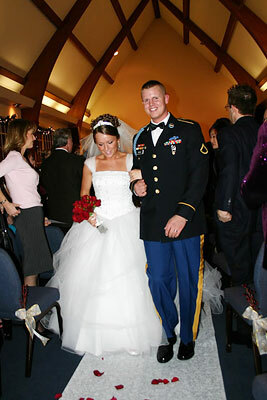 Gabe and Hannah were married not long after he returned from the first deployment. They worked hard at fixing up a small home they were able to buy in Tacoma with the pay he had faithfully saved while serving our country. A year later they were blessed with a baby boy whom they also named Gabriel. Big Gabe now was a loving husband and father. In June of 2006 his brigade was again called to Iraq. Before departing he talked over every detail of what to do if something were to happen. He reminded Hannah that "God put the pieces together" in the beginning of their relationship and would "still be putting the pieces together" if he didn't return. Their relationship was lived in harmony so there would be no regrets if something happened. He also provided for the care of his wife and son. Before departing, he and his immediate fellow soldiers were surrounded by church family in prayer in a special flag folding service at their church, Discovery Baptist, in Gig Harbor, WA. Gabe was often commended for his willingness to serve our country without complaint. However, he responded that Hannah was the greater hero for her sacrifice of being home without him. 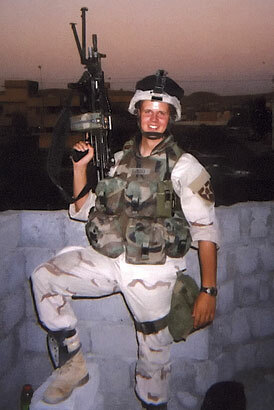 Hannah was jolted awake early on August 21st, 2006 by two army chaplains. They brought news her husband had been killed the day before by sniper fire in Mosul, Iraq. He had been assisting in the arrest of three dangerous insurgents. Army officials estimated that at least several dozen lives may have been saved by the arrest of these men. Gabe's deep love for Hannah was evident again two days after his death. Family members were talking to Army chaplains about Gabe's caring heart when a florist delivery truck arrived with a package. Inside the box were flowers, a box of chocolates and a loving note to his wife which he sent the day before his death. God's hand was evident. A spirit of sacrifice and concern for others motivated Gabe. A book of military quotes was found among his things sent home. One quote highlighted was by Nathan Hale: "I only regret that I have but one life to lose for my country."" Just below it a quote from Manning Coles read, "If a country is worth living in, it is worth fighting for." Gabe wrote in the margin "right on the money." Shortly before SGT De Roo fell, he said that if any soldier had to die first he would rather it be him so others would have time to get right with God. Amazingly, he was the first soldier to fall during the second deployment of the Stryker Brigade of almost 5000 men. He had just finished reading the book Instruments in the Redeemer's Hands. Certainly God did use Gabe as an instrument in the lives of others. 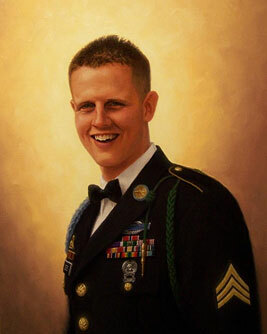 For his example as a soldier he was awarded the bronze star posthumously. Before Gabe died he said someday he would like to return to Iraq to do Christian ministry. Since his death a special De Roo Memorial Fund was established. It supports new ministries in that part of the world bringing many more blessings to others. SGT De Roo made this decision while in his teens and it governed all of his life thereafter. He lived for the One Who had sacrificed all for him. Gabe was also willing to die for his country because of Christ. The inscription on Gabe's headstone is from John 15:13, which reads "Greater love hath no man than this, that a man lay down his life for his friends." Christ gave His life for every one of us. Only those who trust Him may be forgiven. May we be willing to accept by faith God's gift of forgiveness through Christ rather than trusting in our own good works. Printed copies of this story may be obtained by contacting Discovery Baptist Church, 4902 Gustafson Dr. NW, Gig Harbor, WA 98335.